I picked up Tuesdays With Morrie the other day. It's a book I've meant to read for some time. A remarkably quick read it turns out. I knew the basic idea of the book, that an old man, dying with dignity, takes the time to share what he's learning with a returned prodigal student. What I didn't know is the central figure is dying of ALS. That hit a little close to home because a friend of mine is fighting the same fight. Ralph is in his early 50s, far too young for ALS. I guess the disease forgot to check his driver's license. I saw Ralph about a week ago. It had been a month or two and in that short time he is already walking with a cane. ALS starts in the legs and marches relentlessly up the body shutting off the lights as it goes. These are the good days, he can still walk. I saw him and smiled and then I must have noticed the cane -- it wasn't there last time I saw him. Ralph reached out a hand to touch my arm and smiled again. Shouldn't I be the one comforting him? I wanted to look away, I think he knew that. Thinking on it now I've come to believe that one of the greatest gifts we can give is to look a dying man in the eye. To be able to say "I know you're going, but you're not gone yet. I will not make you disappear. I will not practice forgetting." One of the lines that stands out to me from Tuesdays is "death is not contagious". I think we have a natural inclination to try and distance ourselves from death. But it's so ridiculous, death may not be contagious, but it's is congenital. Everybody dies. Why do we pretend it isn't so? ~ from "Sailing to Byzantium"
The choice is his now to sing or be silent. I cannot imagine Ralph sitting this one out. The choice is also mine. Life is sweet, but short, and what lasts is only what we cannot hold on to. Silence is such a waste. This song has a special place in my heart and seemed just perfect for today. I wonder how much more love there would be in the world if we said how we feel outloud and more often? It's beginning to look like Spring here on the west coast. I had the first picnic of the year yesterday. Granted, it wasn't really picnic weather, but it was lovely. I was getting the groceries out of my car this afternoon and realized that the maple tree in the front yard was in bud. Only just barely in bud, but enough to count. The honeysuckle already has miniature leaves. Spring is just around the corner. I took a walk through my favourite greenhouse today. This time of year it's so silent, and as always, it smells incredibly alive. Who needs a Zen retreat when you can take a walk like that? I know that this has been a harsh winter in a lot of areas, and it's still a harsh winter in upstate New York. (What exactly do you do when there's over 100 inches of snow? That's more than 8 feet!) Let me offer this hope -- Spring is coming. 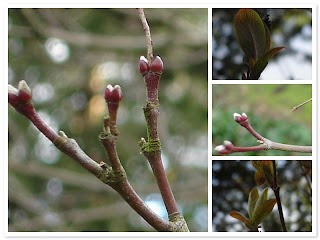 The buds in my garden are already singing its fanfare.